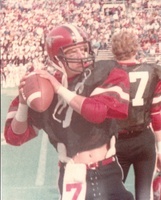 Hess threw for a state-record 3,154 yards and 37 touchdowns to lead Eastland to an unbeaten season and the Class 2A state title in 1982. The Mavericks ended two-time defending champion Pilot Point's 42-game unbeaten streak in the regional playoffs, 21-20, in a game sportswriters consider among the most exciting in Texas history, then dominated East Bernard in the final, 28-6. Hess was voted Texas High School Player of the Year for all classifications, a first-team all-state selection for a second straight year, and a Parade All-American as a senior. He also played in the Texas High School All-Star and Oil Bowl games. Coached by his father, Rod Hess, he ended his high school career with a state-record 5,771 passing yards and 63 TD passes, the fourth-highest total in Texas history at the time. He went on to play at Texas A&M and Iowa before returning to Texas to coach high school football.